Some people do not believe that the church was in God’s plan from the Beginning – that God was surprised when the Jews rejected Jesus. The implication is that the church was an afterthought because man thwarted God’s initial plan. These people do not believe that the Old Testament prophesies regarding the Kingdom have anything to do with the church. The question must be answered, did God have a plan for man from the beginning or not? Do we really think so highly of ourselves that we could go against God and defeat Him? Or do we think that the Creator of all things is not powerful enough to see His plans through? 1 Peter 1:18–20 having been foreknown indeed before the foundation of the world, He was made manifest in these last times for you. Romans 8:28–30 God predestined the church and the plan from the beginning. 2 Thessalonians 2:18 God has from the beginning chosen you (the church) to salvation. 2 Timothy 1:9 He saved us and called us according to His purpose in Christ before the world began! The Scriptures repeatedly tell us that the church was in His eternal plan all along. Ephesians 1:3–14 has a capsule of God’s vision and eternal purpose for us and the church. God’s purpose is clearly laid out along with the plan in the past, the present working of it and the future glory. The scheme of redemption was no afterthought on the part of God. Jesus did not come to set up an earthly kingdom. Instead He came to set up a way for man to live his life and be restored to God through the forgiveness of sin. The purpose of the church is to be the collective of people who are restored, forgiven and striving to please God. Is the church really a part of God’s eternal purpose? Ephesians 3:8–12 To me, the very least of all the saints, this grace was given, to preach among the Gentiles the unsearchable riches of Christ, (9) and to enlighten all as to what is the administration of the mystery, which had been hidden from the ages in God, who created all things through Jesus Christ; (10) that the manifold wisdom of God might be made known by the church to the rulers and authorities in the heavenlies, (11) according to the eternal purpose which He made in Christ Jesus our Lord, (12) in whom we have the boldness and the access with confidence through faith in Him. Paul clearly explains that the church was intended to be the means by which mankind would learn about the wisdom of God and the plan of salvation in Christ. The church wasn’t an audible called on the line of scrimmage — it was part of His eternal purpose. The Scofield Study Bible says that the church is a kind of “mystery parenthesis” and goes on to state that God never intended for there to be a church. This completely denies Old Testament prophesy that speak to Gentiles coming to God after the Messiah comes. So let’s be logical about this. If man was able to thwart God’s plan the first time that Jesus came, what is to keep man from doing so again the next time He comes? And if that is the case, then how can the premelinialist have any credibility in thinking that God will win some fantastic battle of Armageddon and set up a 1,000-year reign? The church is the bride of Christ (2 Corinthians 11:2, Ephesians 5:25–27) and the “fullness of Him” (Ephesians 1:22 & 23). In Ephesians 3:20–21, Paul declares that Christ is glorified through His church forever. 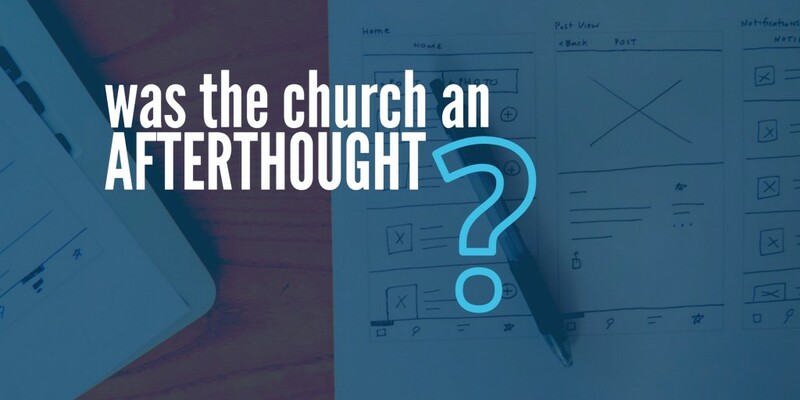 Knowing these things, it is not reasonable to believe that the church was an afterthought of God, but rather, an important part of God’s eternal purpose that He designed before He created the world. I’m looking for some quotations from Dispensational primary sources that makes use of the word “afterthought” or that actually infer that God was caught off guard by the Jews rejection of Christ and that the Church had never entered His mind until Christ was crucified. In order to win the debate with Dispensationalists, I need to conclusively prove from their own writings that they are actually Open-Theists. So far, I can only see that Dispensationalists believe the Church to be part of the secret counsel of God’s will, not an afterthought.